Astronaut training describes the complex process of preparing astronauts for their space missions before, during and after the flight, which includes medical tests, physical training, extra-vehicular activity (EVA) training, procedure training, rehabilitation process, as well as training on experiments they will accomplish during their stay in space. The training is geared to the special conditions and environments astronauts will be confronted with during launch, in space, and during landing. All phases of the flight must be considered during training to ensure safety to, and functionality of the astronauts, as well as to ensure a successful completion of the mission. The Apollo astronauts that walked on the Moon also received training for geology fieldwork on the Lunar surface. The effects of launching and landing has various effects on astronauts, with the most significant effects that occur being space motion sickness, orthostatic intolerance, and cardiovascular events. About three-fourths of astronauts experience space motion sickness, with effects rarely exceeding two days. There is a risk for post-flight motion sickness, however this is only significant following long-duration space missions. Post-flight, following exposure to microgravity, the vestibular system, located in the inner ear is disrupted because of the microgravity-induced unresponsiveness of the otoliths which are small calcareous concretions that sense body postures and are responsible for ensuring proper balance. In most cases, this leads to some postflight postural illusions. Pre-existing cardiovascular diseases: these are typically selected-out during astronaut selection, but if they are present in an astronaut they can worsen over the course of the spaceflight. Cardiovascular events and changes occurring during spaceflight: these are due to body fluids shift and redistribution, heart rhythm disturbances and decrease in maximal exercise capacity in the micro gravity environment. These effects can potentially lead the crew to be severely incapacitated upon return to a gravitational environment and thus unable to egress a spacecraft without assistance. Orthostatic intolerance leading to syncope during post-flight stand test. 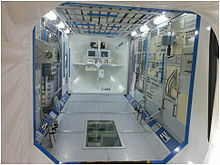 An internal view of ESA's Columbus module training mockup, located at the European Astronaut Centre in Cologne, Germany. Astronauts must familiarize themselves with all the spacecraft components during their training. During training, astronauts are familiarized with the engineering systems of the spacecraft including spacecraft propulsion, spacecraft thermal control, and life support systems. In addition to this, astronauts receive training in orbital mechanics, scientific experimentation, earth observation, and astronomy. This training is particularly important for missions when an astronaut will encounter multiple systems (for example on the International Space Station (ISS)). Training is performed in order to prepare astronauts for events that may pose a hazard to their health, the health of the crew, or the successful completion of the mission. These types of events may be: failure of a critical life support system, capsule depressurization, fire, and other life-threatening events. In addition to the need to train for hazardous events, astronauts will also need to train to ensure the successful completion of their mission. This could be in the form of training for EVA, scientific experimentation, or spacecraft piloting. External events refers more broadly to the ability to live and work in the extreme environment of space. This includes adaptation to microgravity (or weightlessness), isolation, confinement, and radiation. The difficulty associated with living and working in microgravity include spatial disorientation, motion sickness, and vertigo. During long-duration missions, astronauts will often experience isolation and confinement. This has been known to limit performance of astronaut crews and hence training aims to prepare astronauts for such challenges. The long-term effects of radiation on crews is still largely unknown. However, it is theorized that astronauts on a trip to Mars will likely receive more than 1000x the radiation dosage of a typical person on earth. As such, present and future training must incorporate systems and processes for protecting astronauts against radiation. Scientific experimentation has historically been an important element of human spaceflight, and is the primary focus of the International Space Station. Training on how to successfully carry out these experiments is an important part of astronaut training, as it maximizes the scientific return of the mission. Once on-orbit, communication between astronauts and scientists on the ground can be limited, and time is strictly apportioned between different mission activities. It is vital that astronauts are familiar with their assigned experiments in order to complete them in a timely manner, with as little intervention from the ground as possible. For missions to the ISS, each astronaut is required to become proficient at one hundred or more experiments. During training, the scientists responsible for the experiments do not have direct contact with the astronauts who will be carrying them out. Instead, scientists instruct trainers who in turn prepare the astronauts for carrying out the experiment. Much of this training is done at the European Astronaut Center. For human experiments, the scientists describe their experiments to the astronauts who then choose whether to participate on board the ISS. For these experiments, the astronauts will be tested before, during, and after the mission to establish a baseline and determine when the astronaut returned to the baseline. The Crew of STS-135 practices rendezvous and docking with the ISS in the Systems Engineering Simulator at the Johnson Space Center on June 28, 2011 in Houston, Texas. AsCans initially go through Basic Training, where they are trained on Soyuz, and ISS systems, flight safety and operations, as well as land or water survival. Pilot AsCans will receive training on NASA's T-38 Trainer Jet. Furthermore, because modern space exploration is done by a consortium of different countries and is a very publicly visible area, astronauts received professional and cultural training, as well as language courses (specifically in Russian). The final phase is the Intensive Training. It starts at about three months prior to launch and serves to prepare the candidates specifically for the mission they have been assigned to. Flight-specific integrated simulations are designed to provide a dynamic testing ground for mission rules and flight procedures. The final Intensive Training joint crew/flight controller training is carried out in parallel with mission planning. This phase is where candidates will undergo mission specific operational training, as well as experience with their assigned experiments. Crew medical officer training is also included to effectively intervene with proactive and reactive actions in case of medical issues. Astronaut training in Europe is carried out by the European Astronaut Centre (EAC), headquartered in Cologne, Germany. European training has three phases: Basic training, Advanced training, and Increment Specific Training. Soyuz capsule simulator located at the EAC in Cologne, Germany. ESA astronauts will simulate operations in the capsule at the EAC. For all ESA selected astronauts, Basic Training begins at the EAC headquarters. This section of the training cycle has four separate training blocks that last 16 months. Astronauts will receive an orientation on the major spacefaring nations, their space agencies, and all major manned and unmanned space programs. Training in this phase also looks into applicable laws and policies of the space sector. Technical (including engineering, astrodynamics, propulsion, orbital mechanics, etc.) and scientific (including human physiology, biology, earth observation, and astronomy) basics are introduced, to ensure that all new astronauts have the required base level of knowledge. Training is done on ISS operations and facilities, including an introduction to all major operating systems on board the ISS that are required for its functionality as a manned space research laboratory. This phase also covers in-depth systems operations for all spacecraft that service the ISS (e.g. Soyuz, Progress, Automatic Transfer Vehicle (ATV), and the H-II Transfer Vehicle (HTV)), as well as ground control and launch facility training. This training phase also focuses on skills such as robotic operations, rendezvous and docking, Russian language courses, human behavior and performance, and finally a PADI open water scuba diving course. This scuba course provides basic EVA training at ESA's NBF before moving onto the larger NASA training facility at the Lyndon B. Johnson Space Center. Advanced Training includes a much more in-depth look into the ISS, including learning how to service and operate all systems. Enhanced science training is also implemented at this time to ensure all astronauts can perform science experiments on board the ISS. This phase takes around one year to complete and training is completed across the ISS partner network, no longer only at the EAC. It is only upon completion of this phase that astronauts are assignment to a spaceflight. Increment-Specific Training starts only after an astronaut has been assigned to a flight. This phase lasts 18 months and prepares them for their role on their assigned mission. During this phase crew members as well as backup crews will train together. The crew tasks on the ISS are individually tailored, with consideration to the astronaut's particular experience and professional background. There are three different user levels for all on-board equipment (i.e. user level, operator level, and specialist level). A crew member can be a specialist on systems while also only being an operator or user on others, hence why the training program is individually tailored. Increment Specific Training also includes training to deal with off-nominal situations. Astronauts will also learn how to run the experiments that are specifically scheduled for their assigned missions. Training for cosmonauts falls into three phases: General Space Training, Group Training, and Crew Training. General Space Training lasts about two years and consists of classes, survival training, and a final exam which determines whether a cosmonaut will be a test or research cosmonaut. The next year is devoted to Group Training where cosmonauts specialize in the Soyuz or ISS as well as professional skills. The final phases, the Crew Training phase, lasts a year and a half and is dedicated to detailed vehicle operations procedures, ISS training, and English language. Training primarily takes place at the Yuri Gagarin Cosmonaut Training Center. The center facilities have full size mockups of all major Soviet and Russian spacecraft including the ISS. As with the ISS astronauts, cosmonauts train in the USA, Germany, Japan, and Canada for specific training in the various ISS modules. The Japanese human spaceflight program has historically focused on training astronauts for Space Shuttle missions. As such, training previously took place at NASA’s Lyndon B. Johnson Space Center, and followed that of NASA astronauts and other international participants in the Space Shuttle program. Since the development of domestic training facilities at the Tsukuba Space Center, training has increasingly taken place in Japan. With Japan’s participation in the ISS, the training of Japanese astronauts follows a similar structure to that of other ISS partners. Astronauts carry out 1.5 years of Basic Training mainly at Tsukuba, followed by 1.5–2 years of Advanced Training at Tsukuba and ISS partner sites. Training for any international ISS astronauts involving the Kibo module will also be carried out at Tsukuba Space Center. Advanced Training is followed by Increment-Specific Training, which, along with any Kibo training, will be carried out at Tsukuba. EVA training for Kibo takes place in the Weightless Environment Test System (WETS). WETS is a Neutral Buoyancy Facility featuring a full-scale mock-up of the Kibo module on the ISS. The Tsukuba Space Center also includes medical facilities for assessing suitability of candidates, an isolation chamber for simulating some of the mental and emotional stressors of long duration spaceflight, and a hypobaric chamber for training in hull breach or Life Support System failure scenarios resulting in a reduction or loss of air pressure. Although official detail of the selection process for the Shenzhou program is not available, what is known is that candidates are chosen by the Chinese National Space Administration from the Chinese air force and must be between 25 and 30 years of age, with a minimum of 800 hours flying time, and a degree-level education. Candidates must be between 160 cm and 172 cm in height, and between 50 kg and 70 kg in weight. For China's Shenzhou astronauts, training begins with a year-long program of education in the basics of spaceflight. During this period, candidates are also introduced to human physiology and psychology. The second phase of training, lasting nearly 3 years involves extensive training in piloting the Shenzhou vehicle in nominal and emergency modes. The third and final stage of training is mission specific training, and lasts approximately 10 months. During this phase of training, astronauts are trained in the high fidelity Shenzhou trainer, as well as the Neutral Buoyancy Facility located at the Astronaut Center of China (ACC), in Beijing. As well as time spent in the Neutral Buoyancy Facility (NBF), training for EVA takes place in a high vacuum, low temperature chamber that simulates the environmental conditions of space. At all stages of training, astronauts undergo physical conditioning, including time in a human centrifuge located at the ACC, and a program of micro gravity flights, carried out in Russia. The Indian human space flight program still awaits a formal go ahead. Once cleared the mission is expected to take two Indians in a Soyuz-type orbital vehicle into low earth orbit. The training for these astronauts should be based on the lessons learned from training India’s only Cosmonaut Wing Commander Rakesh Sharma (See Salyut-7 1984) and through India’s international co-operation with NASA and Roscosmos. This would allow India to gain insights from their rich experiences in human spaceflight. There also lies a possibility that India may go proceed through its human spaceflight program individually, necessitating the Indian Space Research Organisation (ISRO) to develop its own training program. For astronaut training, India is deciding a place which is at a distance of 8 to 10 km from Kempegowda international airport. This land is under the ownership of ISRO. Astronaut training and biomedical engineering centers will be built on it. Though India’s first man mission training will take place in USA or in Russia, this place can be used for future training. Moreover, center will have chambers for radiation regulation, thermal cycling and centrifugal for the acceleration training. .
What type and extent of training is sufficient? Who will qualify space tourists as fit for travel? How will new regulations comply with existing medical boards? What selection-out criteria need to be employed to reduce dangers to space tourists? Medical regulations for commercial space flight might mitigate commercial space company risk by selecting only those capable of passing standard medical criteria, as opposed to allowing anyone who can purchase a ticket to fly. The first generation of commercial space flight will likely be suborbital trajectories which invoke significant acceleration changes, causing cardiovascular and pulmonary issues. Because of this any future medical criteria for commercial spaceflight participants needs to focus specifically on the detrimental effects of rapidly changing gravitational levels, and which individuals will be capable of tolerating this. Bioastronautics and upper-atmospheric research have been conducted by Project PoSSUM scientist-astronaut candidates since 2015. As of October 2018, the program has attracted members from 37 different countries and published research on mesospheric dynamics and human performance in space suits, microgravity, and post-landing environments. Current research on fitness training and strategies for commercial astronauts conducted by Astrowright Spaceflight Consulting, the first commercial firm to offer dedicated fitness training for space tourists, suggests that conventional fitness training is inadequate to support safe movement in microgravity, and that training utilizing reduced points of stability should be emphasized. Astronauts for long term missions such as those to the Moon, an asteroid, or even to Mars need to carry out multiple tasks and duties, because on such missions the astronauts will need to function largely autonomously, and will need to be proficient in many different areas. For these types of missions, the training to prepare astronauts will likely include training as doctors, scientists, engineers, technicians, pilots, and geologists. In addition there will be a focus on the psychological aspects of long-duration missions where crew is largely isolated. Currently a six-month mission to the ISS requires up to five years of astronaut training. This level of training is to be expected and likely to be expanded upon for future space exploration missions. It may also include in-flight training aspects. It may be possible that the ISS will be used as a long-duration astronaut training facility in the future. A powerful tool for astronaut training will be the continuing use of analog environments, including NASA Extreme Environment Mission Operations (NOAA NEEMO), NASA's Desert Research and Technology Studies (Desert RATS), Envihab (planned), Flight Analog Research Unit, Haughton-Mars Project (HMP), or even the ISS (in-flight). In fact, at NEEMO a total of 15 mission astronauts (known as aquanauts) have been trained for future missions to asteroids. The use of virtual reality will also continue to be used as a means of training astronauts in a cost effective manner, particularly for operations such as extra-vehicular activity (EVA). These missions are not completely independent without the presence of robots. This opens up a new avenue towards Human-Robot Interaction which has to be thoroughly understood and practised to develop a harmonious relationship between astronauts and robots. These robots would aid the astronauts from being their personal assistants to next generation of extreme environment explorers. Currently there is a robot on the ISS aiding the astronauts in their mammoth tasks with a human touch. Intercultural and human robot interaction training is the need of the hour for long duration missions. Training also has to be evolved for moon landing to Manned mission to Mars. Factors like crew dynamics, crew size, and crew activities play a crucial role as these missions would last from 1 year to Moon to 3 years on Mars. The training required for such missions has to be versatile and easy to learn, adapt, and improvise. ^ Lewis, Robert (2017-12-08). "Medical Examination Requirements (MER) for Former Astronauts". NASA. Retrieved 2018-11-29. ^ Kale, Sneha R; Master, Hiral S; Verma, Chhaya V; Shetye, Jaimala; Surkar, Swati; Mehta, Amita (2013). "Exercise Training for Astronauts". Indian Journal of Physiotherapy and Occupational Therapy - an International Journal. 7 (2): 82. doi:10.5958/j.0973-5674.7.2.017. ISSN 0973-5666. ^ Oddsson, Lars IE; Karlsson, Robin; Konrad, Janusz; Ince, Serdar; Williams, Steve R; Zemkova, Erika (2007-07-10). "A rehabilitation tool for functional balance using altered gravity and virtual reality". Journal of NeuroEngineering and Rehabilitation. 4: 25. doi:10.1186/1743-0003-4-25. ISSN 1743-0003. PMC 1936992. PMID 17623080. ^ Heer, Martina; Paloski, William H. (2006-10-30). "Space motion sickness: incidence, etiology, and countermeasures". Autonomic Neuroscience: Basic & Clinical. 129 (1–2): 77–79. doi:10.1016/j.autneu.2006.07.014. ISSN 1566-0702. PMID 16935570. ^ DURANTE, M and FA CUCINOTTA. 2008. Heavy Ion Carcinogenesis and Human Space Exploration. Nature Rev Cancer, 2 May, pp.465-472. ^ MORRING, F. 2009. Astronaut Training. Aviation Week and Space Technology, pp.48-49. ^ Kelly, Scott (2017). Endurance: A Year in Space, a Lifetime of Discovery. With Margaret Lazarus Dean. Alfred A. Knopf, a division of Penguin Random House. p. 50. ISBN 9781524731595. Unlike the early days of spaceflight, when piloting skill was what mattered, twenty-first-century astronauts are chosen for our ability to perform a lot of different jobs and to get along well with others, especially in stressful and cramped circumstances for long periods of time.